I used to keep on top of getting my hair done, having a massage, getting my eyebrows waxed but now that I have a child those things don’t always happen when needed or planned. I have had to resort to home pedi/mani, waxing or plucking and home dye kits at times when money was tight or time was not there. 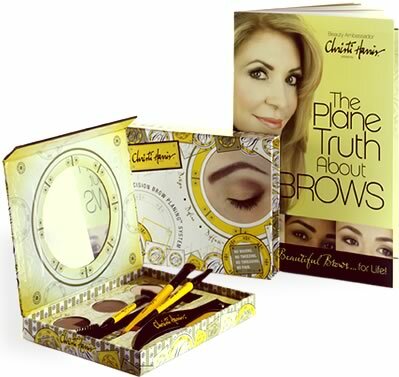 I was happy to try out some of brow planning tools from Christi Harris. Its like a makeover for your eyebrows which I am in need of right now. I loved how easy everything was to use with simply directions to help along the way. The Seal-N-Shine is like a hair product for your eye brows. Kinda like a gel or hair spray for this fly away brows. The last thing is my favorite. The Precision Brow Planing Shears. ($29.99) I hate tweezers and everything about them…they hurt and I end up always pinching my skin and leaving a red mark. They are very easy to use and they are quite sharp so they do a fab job. I really think these are great products. Very simple to use with step by step instructions and pictures.